To make Pega Intelligent Virtual Assistant for Email™ more robust and responsive to users, you can now respond quickly and accurately based on the information that is extracted from emails and their attachments. The system displays a confidence score, a detected localization language, and a topic category for an email. The information that is displayed also includes entities that are detected in email attachments. The system can pull data, such as a date, a name, or an address, out of an email or its attachments and automatically assign the data to a spun-off business case property. 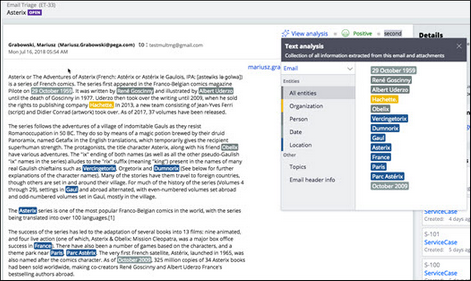 To help you find and understand this information, the system highlights detected entities in different colors on the text analysis page and in the body of the email.